Currently, rheumatism is considered one of the most common and dangerous diseases of mankind. Therefore, despite the fact that significant progress has been made in its treatment, it is difficult to overestimate the importance of this pathology, both in the medical and social aspects. As a rule, the disease develops in childhood, but heart lesions, due to the dominant latent course, are detected only in adult patients, often leading to temporary disability, and in 10% of cases even to disability. Rheumatism (in Greek “spreading over the whole body”) is a systemic inflammatory disease that occupies a rather peculiar position among other diseases of the connective tissue. The predominant site of localization of this pathology is the cardiovascular system (rheumatism affects all membranes of the heart and leads to deformation of the valvular apparatus, which becomes the reason for the development of heart failure). The causative agent of rheumatism is streptococcal infection. An important role in the development of the disease is pathological heredity. Characteristically, while the infectious agent circulates in the blood, rheumatism cannot be cured. Currently, the human population, for objective reasons, it is impossible to get rid of streptococcus. Therefore, to date, a panacea for rheumatism, unfortunately, does not exist, that is, it is included in the group of chronic incurable diseases. The mechanism of the origin and development of the disease is associated with two main factors: the presence of antigenic substances in the pathogen common with the tissue of the heart membranes and the cardiotoxic effect of enzymes produced by β-hemolytic streptococcus. With the penetration of infection, the body begins to produce anti-streptococcal antibodies, which form immune complexes with the antigens of the infectious agent that can circulate in the blood and settle in the microvasculature. At the same time, streptococcal enzymes and toxic products of its vital activity have a damaging effect on connective tissue and heart muscle. The localization of the inflammatory process most often becomes the cardiovascular system. Nonspecific inflammatory reaction in joints and serous membranes also develops quite often. For rheumatism, as well as for any other autoimmune pathology, a wave-like course is characteristic, with periods of exacerbations and remissions. Various infectious agents, stress, physical overstrain and hypothermia provoke the development of exacerbations. The pathological process can spread to all of the heart membranes (this condition in clinical terminology is called “pancarditis”), or it can affect one of them. In the early stages of the development of the disease, its clinical picture is determined by myocarditis (it is in the myocardium that the primary morphological disorders are found). Approximately 1.5-2 months after the onset of painful symptoms, inflammatory changes are observed in the inner layer of the heart membrane (endocardium). As a rule, rheumatism first affects the mitral valve, followed by the aortic valve, and then the tricuspid one. Note: rheumatism is not characterized by damage to the pulmonary valve. Cardiac form (rheumatic heart disease). In this state, the heart membranes are inflamed (rhemopancarditis), but first of all - the myocardium (rheumatic myocarditis). Articular form (rheumatic polyarthritis). Observed inflammatory changes in the joints characteristic of rheumatism. Rheumatic chorea (St. Vitus dance). Increased activity of dopaminergitic structures. Rheumatism is a polysymptomatic disease, which, along with general changes in the condition, is characterized by signs of damage to the heart, joints, nervous and respiratory systems, as well as other organic structures. Most often the disease makes itself felt after 1-3 weeks after an infectious disease caused by β-hemolytic streptococcus group A. In subsequent cases, the incubation period is usually shortened. In a separate group of patients, primary rheumatism may occur 1-2 days after hypothermia, even without being associated with an infection. From the very beginning of the disease, patients complain of persistent pain in the heart area, shortness of breath, observed both during exercise, and at rest, with an increased heartbeat. Often, in the right hypochondrium, due to circulatory insufficiency in the great circle, edema appears, accompanied by a feeling of heaviness. This condition is a consequence of an enlarged liver and signals the development of severely current diffuse myocarditis. Pericarditis (rheumatic pericardial injury) is a relatively rare form of pathology. Dry pericarditis is accompanied by constant pain in the region of the heart, and with exudative pericarditis, as a result of accumulation in the cardiac bag of fluff inflammatory fluid that separates the leaves of the pericardium, the pain disappears. With the defeat of the musculoskeletal system develops gradually increasing pain in the knee, elbow, wrist, shoulder and ankle joints. 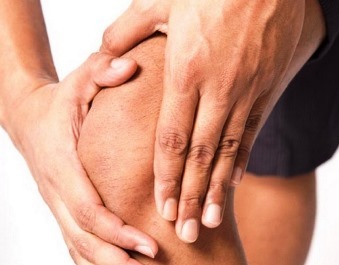 The articular joints swell, and they restrict active movement. As a rule, in case of articular rheumatism, after taking nonsteroidal anti-inflammatory drugs, the pain is relieved rather quickly. With the development of the skin form of rheumatism, capillary permeability increases. As a result, small hemorrhages (petechiae) appear on the lower limbs (in the extensor surface of the joints). Also, often painless nodules appear on the skin of the legs and forearms (their sizes vary from a millet seed to a large pea). However, it is possible the formation of dark red painful large seals (the size of a cherry) penetrating the thickness of the skin and slightly rising above the surface. This pathological condition is called nodal erythema. It can be localized not only in the region of the extremities, but also on the skin of the skull. This is a relatively rare form of pathology (found in 5.4% of patients suffering from rheumatism). The development of the pathological process is accompanied by the occurrence of intense pain, aggravated by inhalation, increased body temperature to 38-40 C. Patients experience seizures of dry, painful cough, pleural noise is heard in the affected half of the chest. Over time, the pain begins to subside, as well as pleural noise. However, the patient's condition worsens. Shortness of breath, feverish state are noted, respiratory noises begin to disappear, a strong weakness, cyanosis appears. Sometimes, due to the large amount of inflammatory exudate, lag in breathing of one half of the chest, a sharp protrusion of intercostal spaces, very strong shortness of breath is possible. Such patients take a forced half-sitting position. It should be noted that severe symptoms in rheumatic pulmonary lesions are relatively rare. More often, the disease is accompanied by milder manifestations of rheumaturitis. When rheumatism is sometimes observed damage to the meninges, the subcortical layer and the medulla. One of the manifestations of the disease is rhewmarea (St. Vitus's dance). This pathology, characterized by involuntary jerky contraction of striated muscles, develops in childhood and adolescence. With a convulsive contraction of the glottis, a choking attack can occur, leading to a sudden death. Rheumatic peritonitis - a pathological condition, often occurring in acute primary rheumatism, is characteristic only of all children and adolescents. The disease develops suddenly. The body temperature rises sharply, and there are signs of dysphagia (nausea, vomiting, abnormal stools, cramping abdominal pain). When making a diagnosis of "primary rheumatism" often there are certain difficulties. This is due to the fact that rheumatic manifestations are very non-specific, that is, they can be observed in other pathologies. And only the detection of a previous streptococcal infection and the presence of two or more signs of the disease can indicate a greater likelihood of rheumatic lesions. Therefore, the diagnosis takes into account the presence of syndromes (syndromic diagnosis of rheumatism stage I). Instrumental diagnosis of rheumatism (cardiovascular syndrome). Laboratory diagnosis. In general, a blood test shows an increase in ESR, leukocyte shift to the left, anemia. In the immunological analysis, ASH titers increase, the number of immunoglobulins of class A, G, M increases, the C-reactive protein, anti-cardiac antibodies and circulating immune complexes are detected. The best therapeutic effect is achieved with early diagnosis of rheumatism, which helps prevent the development of heart disease. The treatment is carried out in stages and in the complex. It is aimed at suppressing the activity of β-hemolytic streptococcus and preventing the development of complications. At the first stage, the patient is prescribed inpatient treatment. It includes drug therapy, diet therapy and physical therapy. Appointments are made taking into account the characteristic features of the disease and the severity of damage to the heart muscle. To eliminate the infectious agent, antibacterial therapy is carried out. The only antibiotic that can cope with pyogenic streptococcus is penicillin. At present, phenoxymethylpenicillin is prescribed for adults and children over 10 years of age. In more severe cases, benzylpenicillin is recommended. Macrolides and lincosamides are used as alternative drugs. The duration of the course of antibiotic therapy is at least 14 days. With frequent colds and exacerbations of chronic tonsillitis, another antibacterial drug (amoxycycline, cephalosporins) can additionally be used. Antirheumatic therapy involves taking nonsteroidal anti-inflammatory drugs, which, depending on the patient's condition, can be used in isolation, or in combination with hormonal agents (no more than 10-14 days). NSAIDs should be used to eliminate signs of an active pathological process (on average, 1-1.5 months). With prolonged and latent rheumatism, patients are shown taking drugs of the quinoline series (plaquenil, delagil). They are applied by long courses, from several months to one or two years. Also during the inpatient treatment period, chronic foci of infection are eliminated (after 2-3 months from the onset of the disease, with an inactive process, it is recommended to remove the tonsils). The main task of this stage is the restoration of the normal functioning of the cardiovascular system and the achievement of complete clinical and biochemical remission. The second stage of treatment is carried out in specialized cardio-rheumatological sanatoriums, where patients are assigned a special health regimen, physical therapy, tempering procedures, differentiated physical activity. Also spa treatment of rheumatism includes mud therapy (applications on the affected joints), radon, hydrogen sulfide, sodium chloride, oxygen and carbon dioxide baths. Clinical observation, prevention of relapse, prevention of disease progression. At this stage, therapeutic measures are being taken to facilitate the elimination of the active course of the pathological process. Symptomatic treatment of circulatory disorders is indicated for patients with heart disease. Also solved issues of rehabilitation, the patient's ability to work and his employment. In the treatment of rheumatism in children, effective antibacterial therapy (single intramuscular administration of penicillin G sodium salt) is primarily prescribed. For hemorrhagic manifestations, oral acid-resistant penicillin V is indicated. If you are allergic to this drug, you can replace it with erythromycin or azithromycin. The term for taking nonsteroidal anti-inflammatory drugs is at least 21 days. In the case of rheumatic heart disease, administration of glucocorticoids (1-2 mg per 1 kg of body weight) for 10-15 days is indicated. When leaving from hormone therapy, salicylates are prescribed. Rheumatism is a disease that does not pose an immediate threat to a patient’s life. The exceptions are acute meningoencephalitis and diffuse myocarditis, occurring predominantly in childhood. In adults, for whom the skin and articular forms of the disease are more characteristic, the course is most favorable. With the development of rheumatic fever, there are minor changes in the heart. The main prognostic criterion for rheumatism is the degree of reversibility of its symptoms, as well as the presence and severity of heart disease. In this case, the most unfavorable are constantly recurrent rheumatic carditis. At the same time, an important role is played by the period of initiation of treatment (the later the therapy is started, the higher the probability of developing a defect). In childhood, rheumatism is much harder than in adults and often causes persistent valve changes. In the case of the development of a primary pathological process in patients who have reached the age of 25, there is a favorable course of the disease without the formation of a defect. It should be noted that the change in cardiac structures occurs only in the first three years since the onset of the initial signs of the disease. If during this time valve valvular disorders are not observed, then the subsequent probability of their occurrence is rather small, even with rheumatism activity preserved. Timely isolation of the patient who has streptococcal infection. Subsequent observation of persons in contact with him (prophylactic single injection of bicillin). Mandatory diagnostic examination of a person who has had streptococcal infection, and subsequent 2-month follow-up with a doctor. Measures to enhance the body's resistance (hardening, constant improvement of immunity, balanced nutrition, exercise therapy). Sanitation of foci of chronic infection. Antirheumatic therapy for long-term use of nonsteroidal anti-inflammatory drugs.